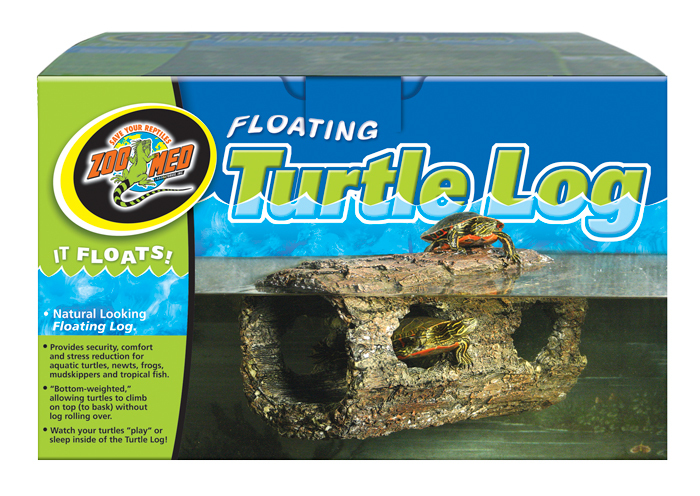 Floating Turtle Log | Zoo Med Laboratories, Inc. The new natural looking Floating Turtle Log provides security, comfort, and stress reduction for aquatic turtles, newts, frogs, mudskippers, and tropical fish. The hollow resin log floats just at the surface so that turtles can bask on top of it or hide submerged inside. Its Bottom-weighted design prevents the log from rolling over, even with two 4″ (10 cm) turtles on top. We’re big fans of turtles here at Zoo Med, and turtles are big fans of Zoo Med’s Floating Turtle Log. Here’s a video of some of our turtles enjoying their floating log and using it as a place to bask or hide. Great backflip, little guy!